Free Fun on a cold wet week? 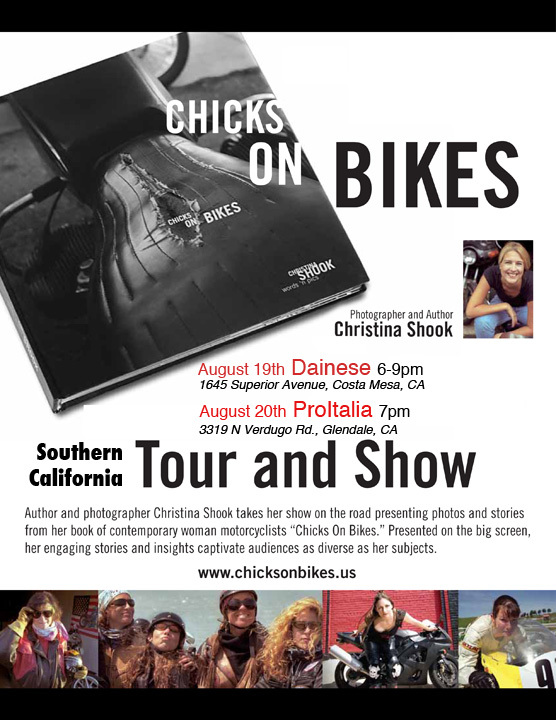 Wrenched Word and Chick Pix book tour. Should I apologize about my bad blogging habits, namely the lack of? To anyone who cares, then yes I do. I have so many fun and interesting things to write about. Here goes my first blog entry of 2010, may many more fab entries follow. Alas it’s shameless promotion that brings me to shout out today. What free fun can you have on a cold wet Northern California week? What do you do in January when it’s wet and chilly? Or when you’re just too much of a sissy to get out there and ride? Not me, no never me, I’d never show up in my comfy warm dry cage Camry… its just that I’ve got these books I have to bring. 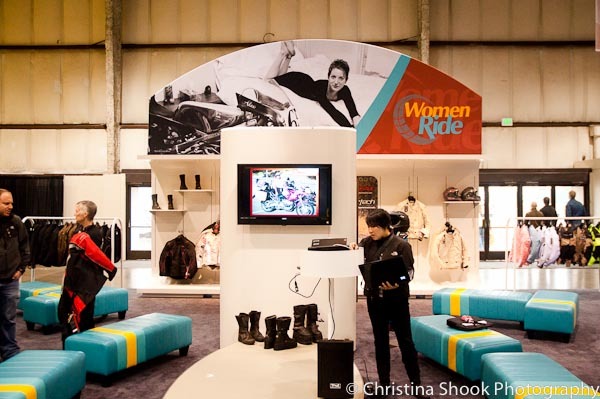 How about heading out for a night of motorcycle related literature and photography? 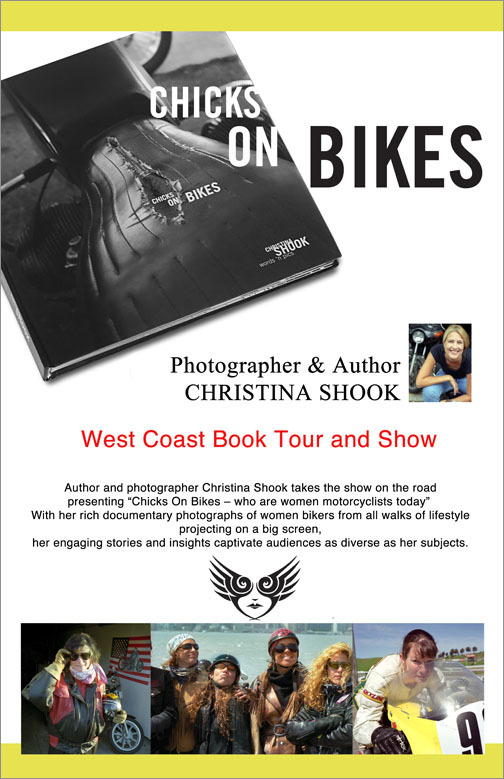 Christina Shook and Ed Milich will be touring motorcycle destinations in San Francisco and northern California beginning January 26 2010 to promote their recently released motorcycle books: Milich’s Wrenched: Man and Machine and Shook’s Chicks on Bikes. Ed doesn’t like to call it poetry, so as not to put off the tough illiterate biker folks. Besides it doesn’t actually rhyme. Ed is an awesome racer who can totally smoke you on the track or on a microphone. His words are raw, funny, dirty, anguished and eminantly readable. See his creds below. 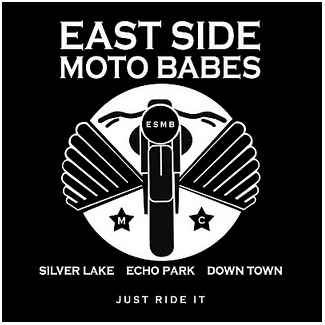 Heartfelt gratitude for organizing this all to Leslie Kay, editor of Urban Moto. Go see their excellent new website. 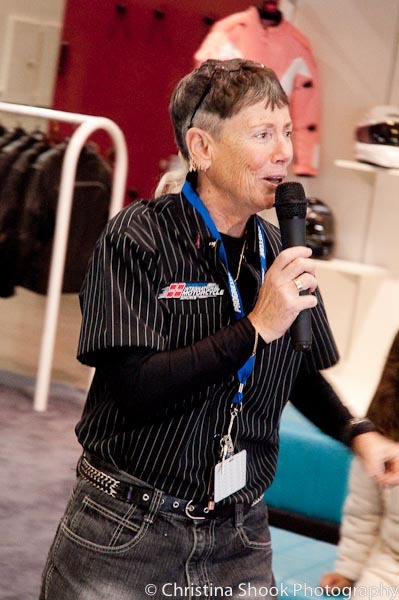 And Jen Bromme, my germanic soul sister and owner of Diewerkstatt bike shop in SF – great mechanics for street or race bikes. 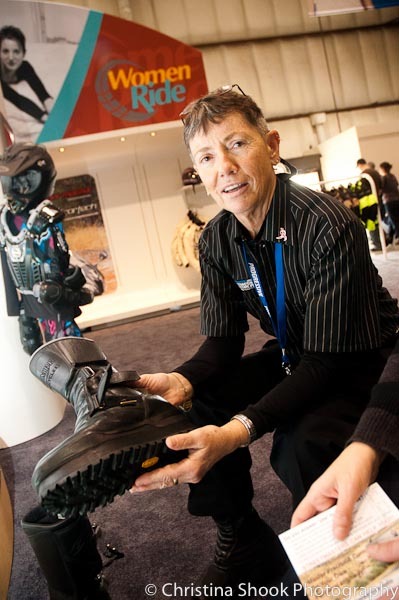 Its that time of year to revise your motorcycle dream list. 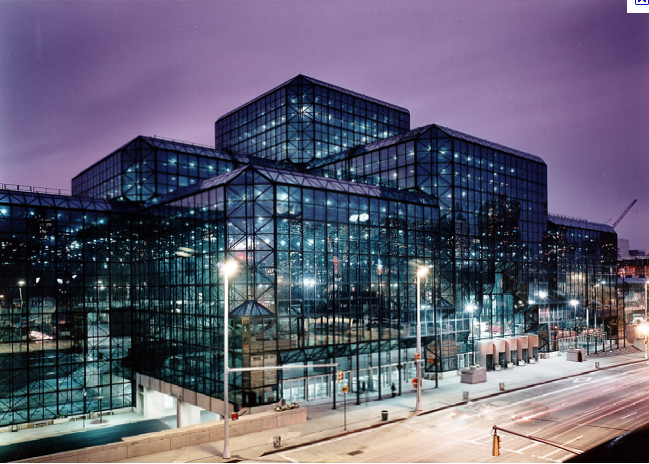 All the bikes from all the makers will be under one roof in San Mateo next weekend – Nov. 20 to 22.for the Cycle World International Motorcycle Show. 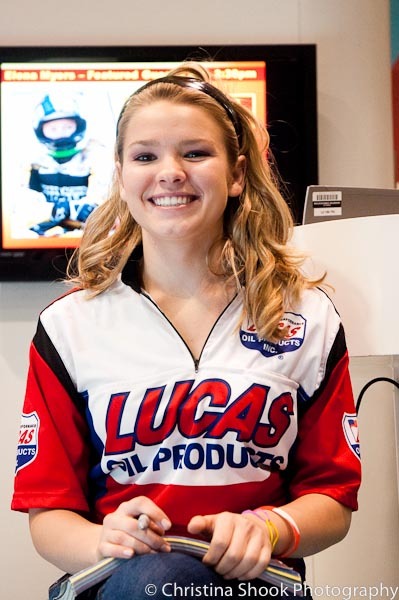 Here’s a discount code special from me to you: go to www.motorcycleshows.com and use the code COB for $3 off entry. 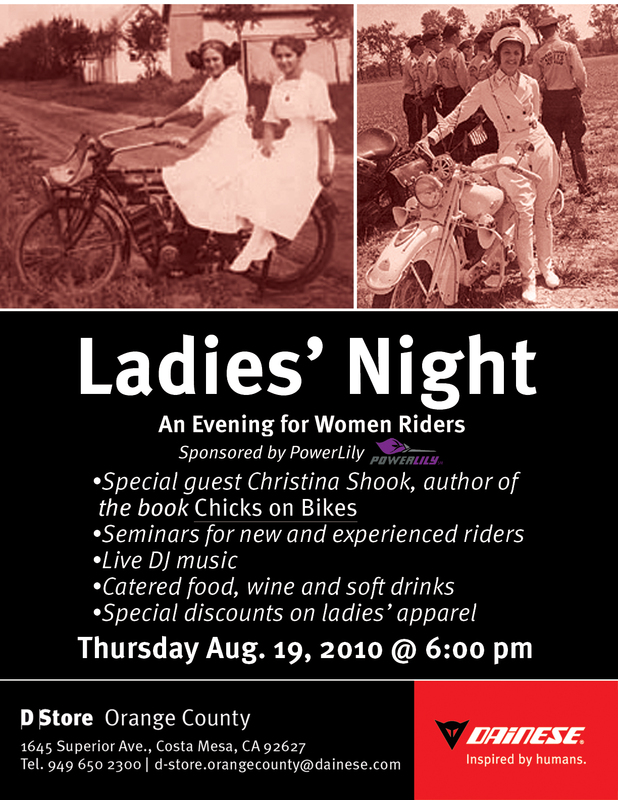 I’ll be speaking on Who Women Riders are Today. Of course there’ll be my pictures for the slide show and I’ve been gathering my facts to open eyes, pop eyes and show ’em that we’re real, we’re here, and we’re kicking butts. I’ll be on in the Hub 11:30 – 12:00 on Sat. and 1 – 1:30 on Sunday. 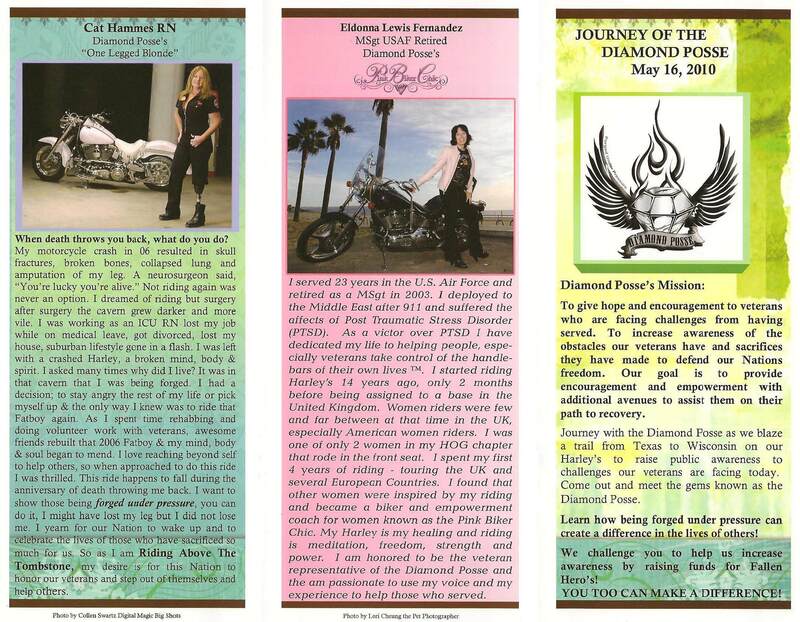 Sue Slate and Gin Shea, founders of the Women’s Motorcycling Foundations and Dirty Dozen fame will be running the Women’s Center. Find the great new gear that is finally seems to be available to fit women.